FlowStone is a perfect tool for education. It can be used by children from secondary/high school level right up to university. The rapid development capabilities of FlowStone mean that you can achieve much more in a short lesson than you could with traditional programming tools. FlowStone can be used to cover a wide variety of subjects, not just IT. Data logging in science, algebra in mathematics, sound synthesis in music - these are just a few of the applications. 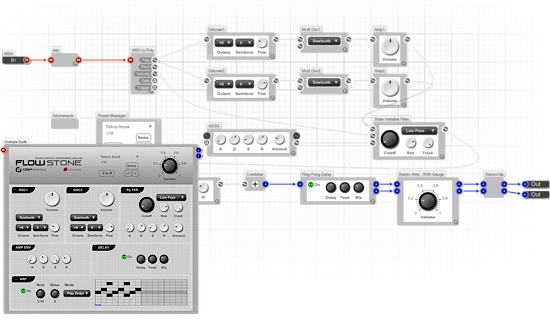 FlowStone allows anyone to create their own sounds, standalone virtual instruments and effects. These instruments and effects can then be used for playing live via MIDI or as VST plugins for use in making music using any of the popular recording software. Our 1 sample-at-a-time processing engine is perfect for filters or anything that requires a single sample feedback loop. If you want even more flexibility you can use the DSP Code component or even go right down to assembler for maximum efficiency. Want an easy way to capture data from the outside world? FlowStone has built in support for many popular data acquisition devices. The example here shows the Labjack U3-LV. One dedicated component in FlowStone will allow you to connect directly to the device. Within minutes you can be up and running, sending and receiving data without any need to worry about proprietry SDKs. FlowStone takes care of all of this leaving you free to focus on what you want to achieve. Serial port communication in FlowStone allows you to connect to a wide range of low-cost robots. You can use Inverse Kinematics (IK) & Proportional Integral Derivative (PID) modules to manage movement and create impressive interactive user interfaces to control everything. By connecting to external analog I/O devices you can stream high data rate signals directly into FlowStone. The Stream data components and DSP code component can then be used to apply any kind of processing you like. All this happens in real time. You can tweak your algorithms and interface live - while your data streams. This makes the development process extremely quick as you see the effects straight away. 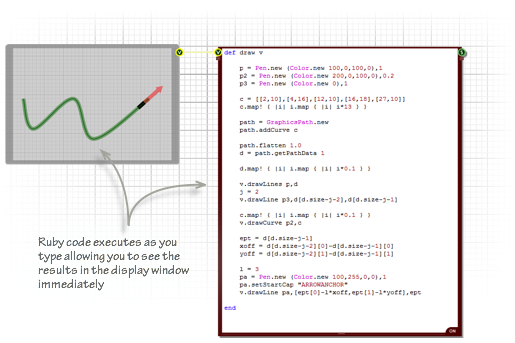 FlowStone has video functions built in. You can easily connect to external webcams, record video to disk and perform complex tasks like motion, colour and face detection with ease. The real-time nature of FlowStone makes it ideal for machine control. 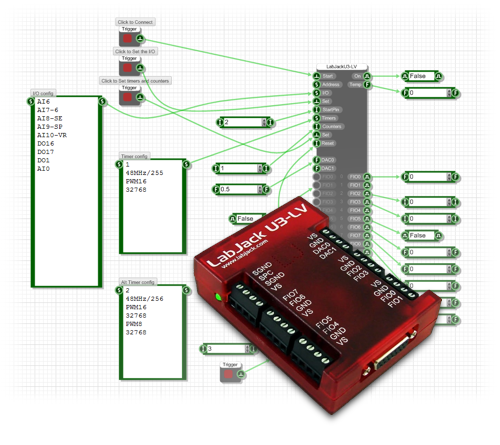 Embedded systems can be used with various input/output hardware to control motors, read sensors, actuate pneumatics etc. Industrial touch screens can be used to provide visual feedback and machine control. Also hardware watchdog times can be activated on the embedded systems to provide added security when dealing with real machines. One benefit of FlowStone is that the end result is usually a stand alone Windows .EXE file. This can then be deployed to an Embedded single board computer running Windows Embedded. A good example of an embedded system that we all know is a ATM cash machine, basically computer with a screen and keyboard etc. but totally closed to the outside user and runs a single application. Using Netvox wireless sensors or the X10 home automation system you can create a completely customised home automation or alarm system. Check when passive infra red sensors are triggered and link this to cameras or lighting. 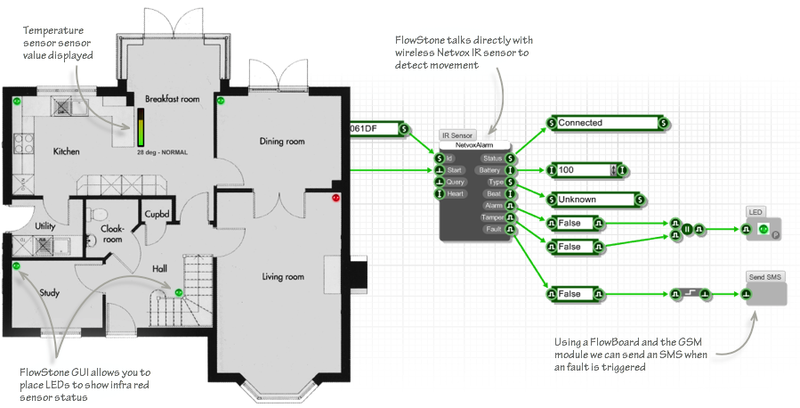 Use FlowBoard and the GSM module to send SMS alerts back to you if key events occur. Switch on and off appliances or lighting. Since the core of any FlowStone application is the use of a PC, laptop or Embedded System, FlowStone applications are suited to data logging as there is always access to a disk drive for storage. Logging can be in the form of text files, databases, XML, audio files etc. Also the networking features of FlowStone can be utilized to provide remote access to data. FlowStone is ideal for test and measurement applications. Using hi-resolution input transducers it is possible to read calibrated input signals and display the results on the computer screen. As well as helping you to develop faster, the immediate feedback you get with FlowStone allows you to experiment with parameters and algorithms in a way that is impossible with traditional programming tools. This makes it ideal for prototyping and we have used FlowStone on may occsions for prototyping FlowStone itself! The example opposite shows how we used FlowStone to experiment with arrow head orientation for curved links. We could try things out live whcih saved us hours of programming time. You can try the software for seven days. There are only two small limitations related to exports compared to the full version but otherwise it's exactly the same. No registration required.